Nancy Paulsen Books, 9780399168567, 32pp. Critically acclaimed author Jabari Asim and Caldecott Honor-winning illustrator E. B. Lewis give readers a fascinating glimpse into the boyhood of Civil Rights leader John Lewis. John wants to be a preacher when he grows up—a leader whose words stir hearts to change, minds to think, and bodies to take action. But why wait? When John is put in charge of the family farm’s flock of chickens, he discovers that they make a wonderful congregation! So he preaches to his flock, and they listen, content under his watchful care, riveted by the rhythm of his voice. 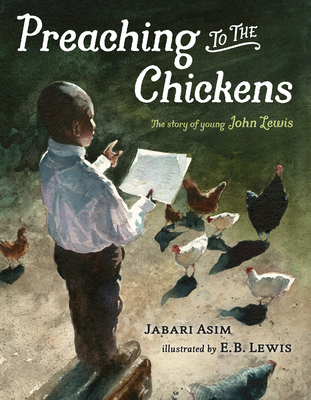 Celebrating ingenuity and dreaming big, this inspirational story, featuring Jabari Asim’s stirring prose and E. B. Lewis’s stunning, light-filled impressionistic watercolor paintings, includes an author’s note about John Lewis, who grew up to be a member of the Freedom Riders, chairman of the Student Nonviolent Coordinating Committee, and demonstrator on the Edmund Pettus Bridge in Selma, Alabama. John Lewis is now a Georgia congressman, who is still an activist today, recently holding a sit-in on the House floor of the U.S. Capitol to try to force a vote on gun violence. His March: Book Three recently won the National Book Award, as well as the American Library Association's Coretta Scott King Author Award, Printz Award, and Sibert Award. Jabari Asim (www.facebook.com/jabariasimwriter) is the author of several adult and children’s books, including Fifty Cents and a Dream—an NAACP Image Award Nominee, CCBC Choice, School Library Journal Editor’s Choice, and Kirkus Best Book. He is an associate professor at Emerson College in Boston and executive editor of The Crisis, the magazine of the NAACP. He recently was honored with a Guggenheim Fellowship. He lives in Newton, Massachusetts. E. B. Lewis (www.eblewis.com) is the acclaimed illustrator of more than seventy books for children, including the Caldecott Honor Book Coming On Home Soon and the Coretta Scott King Honor Book Each Kindness (both by Jacqueline Woodson). He teaches at the University of the Arts in Philadelphia. He lives in Folsom, New Jersey.